(Burlington, ON) – For the first time ever, beer lovers will have the chance to pick the next brew to hit LCBO shelves. 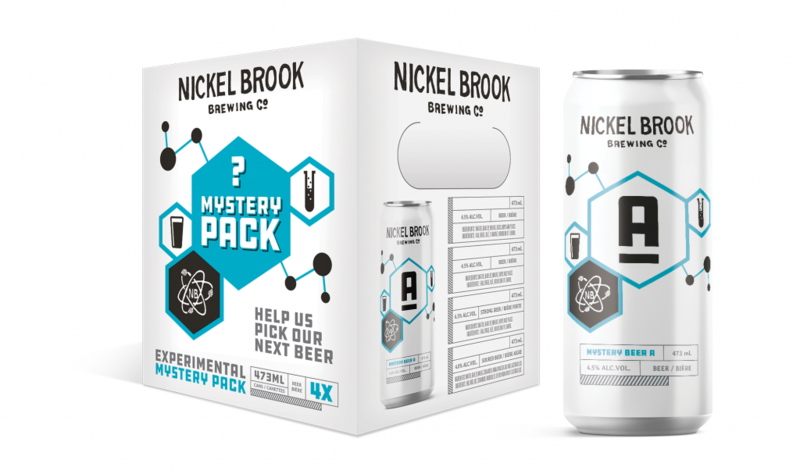 Nickel Brook announced today that it will be launching a Mystery Pack in LCBO stores, and at their brewery Bottle Shop. Containing four beers marked simply “A”, “B”, “C” and “D”, consumers will be encouraged to sample the beers without being swayed by packaging, tasting notes or marketing copy. Customers will then visit www.nickelbrook.com/mysterypack and vote for their favourite. The people’s choice will be launched in the LCBO in Spring 2018. The Nickel Brook Mystery Pack will be available in stores by December, and makes a great gift for beer lovers, Secret Santas, office gift exchanges and more. Nickel Brook Brewing Co. was founded by John and Peter Romano in Burlington, Ontario in 2005. They are committed to using only the finest natural ingredients from around the world, and brew them in small batches for the highest standard of quality. Nickel Brook continues to be an award-winning Ontario craft brewery that constantly strives to push the boundaries of brewing culture.